Sealy vs. Restonic: Which Mattress Brand is a Better Value? Sealy and Restonic are two of the most respected mattress manufacturers in the United States. Both companies sell excellent products, so you will need to look at their individual mattresses to decide which ones are right for you. This guide will help you learn about the basics of each company's popular options. The Sealy Corporation got started in 1881, making it one of the oldest mattress manufacturers still operating today. The company got its start by making cotton mattresses. The products quickly became popular and generated enough money that the company could invest in other materials and mattress technologies. Today, Sealy is one of the most popular mattress manufacturers. This popularity has made it possible for the company to diversify by creating a range of brands and collections. Sealy has accumulated numerous brands over the years. The ones you see most often these days are Sealy, Sealy Posturepedic, and Optimum Sealy Posturepedic. 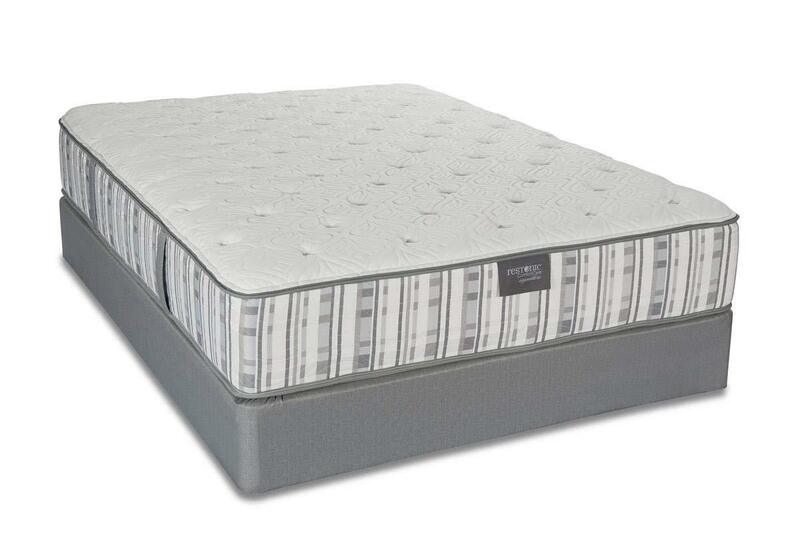 The Sealy brand has two collections: the Innerspring Series and the Gel Memory Foam Series. Beds in the Innerspring Series have Sealy Stability Coils that add support and prevent motion transfer. This is a good option for people who have partners who toss and turn during the night. Innerspring beds also have a memory foam layer that offers extra comfort and a gel foam layer that keeps sleepers cool during the night. Mattresses in the Gel Memory Foam Series include a Polycore support system that will help your body stay in good alignment while you sleep. It also has a thick layers of memory foam and gel memory foam for increased comfort. The Sealy Posturpedic Collection includes three types of mattresses: Posturepedic, Plus, and Premier Hybrid. The regular Posturepedic mattress has a Sealy Embrace Coil, CoreSupport Center, and SolidEdge HD System. These features help you stay in good sleeping posture during the night while enhancing the mattress's comfort. The Plus includes the same features as Posturepedic. The difference is that the mattress includes more of each feature. For instance, the Plus mattress has 20% more Sealy Embrace coils for an even better night's sleep. The Premium Hybrid combines spring and foam technologies for better support, posture, and comfort. The Optimum Sealy Posturepedic collection includes five mattresses: Destiny Gold, Radiance Gold, Inspiration Gold, Elation Gold, and Gel Latex. This is the most expensive Sealy collection, so you can expect extra layers of memory foam and gel cores for the highest level of comfort. Since Sealy sells so many types of mattresses, you can expect a wide range of prices. The Sealy Innerspring Series are usually the cheapest. A Queen sells for about $399. A Queen from the Gel Memory Foam Series starts at $599. Posturepedic mattresses cost a little more. The regular Queen Posturepedic mattress starts at $599. The Premier Hybrid Series starts at $1,299. The Optimum mattresses start at $1,299. The most expensive option in the collection is the Elation Gold, which starts at $2,999. Founded in 1938, Restonic doesn't have quite as much experience as Sealy, but it still has a range of excellent mattresses worthy of your consideration. Restonic organizes its mattresses into three collections: ComfortCare Limited, HealthRest, and ComfortCare. In the ComfortCare collection, you can choose between ComfortCare Signature, ComfortCare Select, and ComfortCare. All of these mattresses use Restonic's patented Marvelous Middle Technology. This feature adds concentrated coils to the mattress to give you more support. If you want even more comfort, consider the ComfortCare Signature. It has a top made from a gel-infused foam. This is supposed to protect pressure points that often cause people to toss and turn during the night. The ComfortCare Limited mattress is an upgraded version of the basic ComfortCare design. It has a TempaGel memory foam top that protects pressure points. Like other ComfortCare mattresses, it also has the Marvelous Middle Technology coils. This mattress's level of craftsmanship makes it stand out from other Restonic mattresses. It's so nice that the top layer has a hand-tufted damask weave. The top also has a layer made of silk and wool that has been infused with graphite so it can wick away moisture during the night. You'll never wake up feeling sweaty again. The HealthRest collection consists of two options: TempaGel and HealthRest Latex. These mattresses are intended to improve health by giving you a better night's sleep and excellent support that will prevent aches and pains in the morning. The TempaGel, as the name suggests, is made from a gel-infused memory foam. This is an excellent option for people who can't sleep well because they always end up feeling stiff halfway through the night. With this type of gel-infused mattress, you don't have to worry about pressure points that cause so many people problems. The HealthRest Latex offers a whole other level of support. With its natural latex core, it's difficult to beat the support that you can get from this mattress. It's also a hygienic option that can help prevent allergies. As long as you are not allergic to latex, this mattress should help you get restful sleep all night long. Restonic makes most of its mattresses in a wide range of sizes that include: Twin, Twin XL, Full, Queen, King, and California King. Unlike Sealy, Restonic does not sell its mattresses directly to consumers. This makes it difficult to know exactly how much the mattresses cost. Always compare prices from several retailers to make sure you get the best price possible. The HealthRest mattress is usually the most expensive option. You can expect to spend anywhere from $1,500 to $2,150 for a Queen. If you don't mind spending some extra money on a luxurious mattress, Sealy has some options that will feel like Heaven. Restonic has some cheaper options that may suit your needs well. If you want better sleep for better health, though, you should consider the Restonic HealthRest mattresses.